It will be a very frustrating thing if you forget the login password of your computer, today, iSeePassword tool will end such tragedy. The password recovery for Windows tool can be the right key, which can remove lost/forgotten local administrator and users’ password for Windows 10, 8, 7, Vista, XP, and Windows Server 2000/2003/2008/2012 quickly and conveniently. You can easily make password reset disk (CD or DVD) with the iOS image file produced by iSeePassword program. Nearly all computer offers the USB boot option, you can fast create a bootable USB flash drive as well with the iSeePassword tool. • 100% Reset your lost or forgotten local Administrator password instantly. • Remove Domain Administrator and other domain user passwords for Windows. 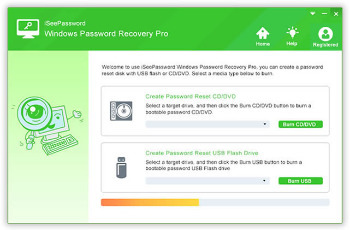 • Reset passwords with a bootable CD, DVD or USB flash drive, easy and fast. • Create a new administrator account easily, get access to your computer directly. • Compatible with Windows 10, 8, 7, Vista, XP, 2000 and 2003/2008/2012 servers etc.